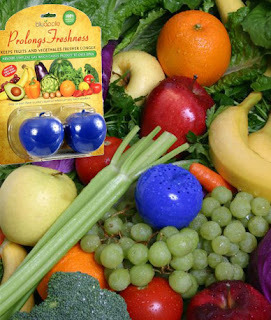 $5 for 2 BluApple Produce Life Extenders + 10% Off for New Shoppers! Right now at Mamasource, you can get two BluApple produce life extenders for only $5.00! New Mamasource shoppers can use the code may10 to save 10%. Cut down on grocery trips and save money by extending the life of your produce with BluApple. Just toss it in with your fruits or veggies and enjoy them for up to three times longer! As the produce emits harmful ethylene gas, BluApple absorbs the gas to slow down the spoiling process. One lasts up to three months in the fridge, and can be refilled an unlimited number of times. It’s an inexpensive, all-natural, and completely safe way to keep produce fresh and delicious. Stock up on several, and give them as gifts to anyone who enjoys fruits and veggies.